AME Network is a free, members-only networking community designed to connect you with peers and industry experts. Participate 24/7 in discussions on topics that impact your business, share files, find professionals who share your interests through the member directory, and more. Start taking advantage of this exciting new member benefit today. Watch this webinar recording to learn more about the AME Network. Once you log in, be sure to upload your profile. To do this click on the silhouette image in the upper right-hand corner, and then select the profile button. If you have a LinkedIn account, you can create your profile in seconds using the "import from LinkedIn" button. Otherwise, add a photo and some background information to tell the community a little about yourself! AME Network has an online directory. 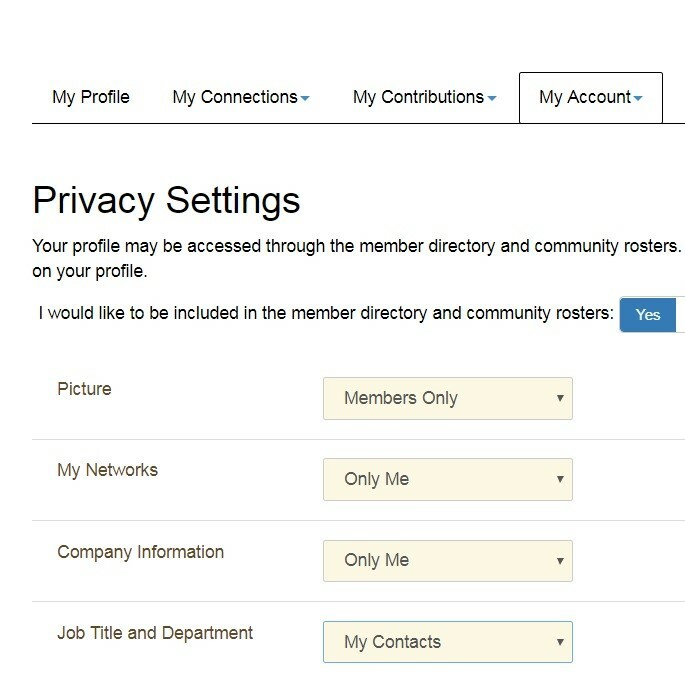 If you don't wish to be included in the member directory, be sure to update your privacy settings. To do so, click on the "My Account" tab on your profile page. You can choose what information share with other members or your personal contacts. Read more about how to add contacts and build your network. AME has already subscribed you to the AME Open Forum, which is the community for all AME members. You have also been subscribed to other communities, such as the Management Team or the National Board. You can explore your communities by selecting "my communities" from the community drop down menu. Here you can pose questions to other AME members, share photos and files, or start discussions on a hot topic. You will receive one digest every day of all posts made to the AME Open Forum. If you'd like to receive real-time notifications every time a discussion is posted, you can change your preferences to real-time notification. You can also change your settings to "no email" if you'd prefer not to receive notifications.To adjust your notification settings for each of your communities, choose "community notifications" from the "My Account" tab on your profile. You must be logged in to adjust your settings. You may be eligible to participate in other AME communities. To explore other communities, select "all communities" from the community drop down menu. Read more about communities, and how to start a discussion. Learn about adding or locating files in the Resource Library. Share your thoughts by posting a blog. Be sure to read the community etiquette guide to familiarize yourself with our posting guidelines and rules.